On October 12, 1940, No. 603 Squadron, reduced to only eight aircraft, took on a large formation of Me109s attacking head on. 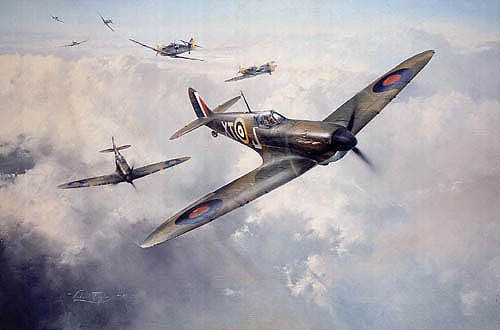 Robert Taylor's vivid portrayal shows Scott-Malden's Spitfire moments after knocking down an Me109 in the encounter, both he and his wingman coming through unscathed. Each print is individually signed by the artist and David Scott-Malden.